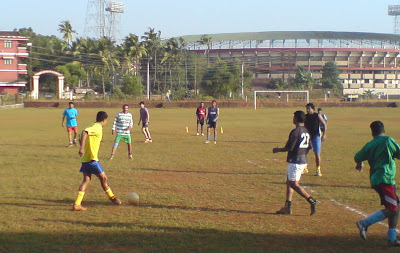 Photo Goa: Twelve men and a Ball! Twelve men and a Ball! Now that's a man's game! 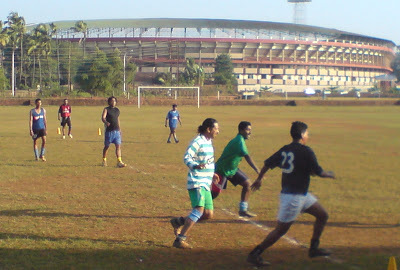 An early morning workout with other beefy friends on the Jawaharlal Nehru Stadium grounds at Fatorda, Margao. "Danny, pass, pass! ", "Camil chedechea, kit' korta re!" alongwith other colourful yells fill the morning practice. "Camil chedechea, kit' korta re!" This blog is about Goa as she really is, with her dimples and freckles et al. There's also a Goan Architecture blog and other useful links on this page.